Are you wondering if a Great Dane Lab mix puppy is right for you? 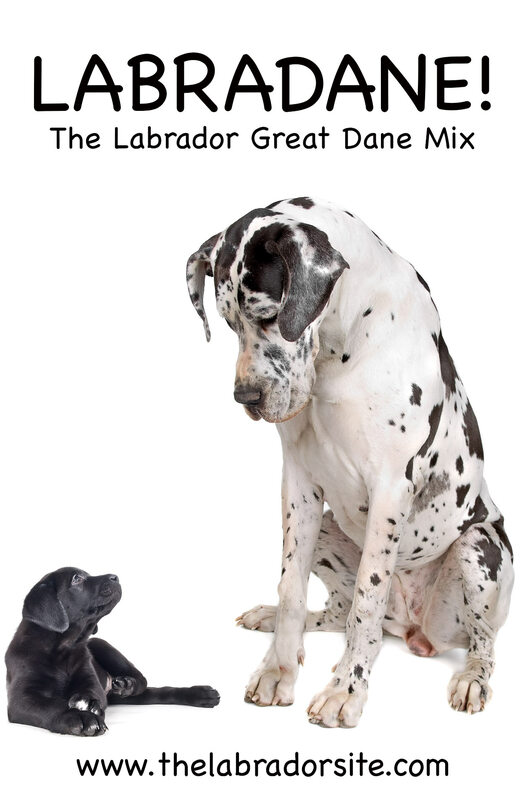 Welcome to our complete guide to the Labrador Great Dane mix! The Great Dane Lab mix is the result of a Great Dane cross Labrador. If you have been looking for the perfect pooch, then you may be weighing the pros and cons of two awesome breeds. If you simply cannot decide, then why not have the best of both worlds and pick a cross-breed? A cross-breed may not sound too fancy, but names like Cockapoo, Goldendoodle, and Puggle are surely enough to make you smile. Well, what about the Great Dane Lab mix or the Labradane? The name Labradane should make you smile, too. While the name may not be nearly as cute as a ‘Schnoodle’, there are quite a few things about the canine that should be celebrated. So, what is so special about the Labradane, and is there anything to be concerned about when looking at the pups? We’ll explore these issues in this article. Before you can really start looking at a mix or cross-breed, you need to understand the controversial nature of choosing one of these dogs as a pet. 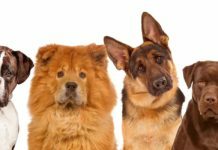 If your dog is a family dog and meant to bring love and joy to your life, then you may not care about the quirky name and the controversy of choosing a cross breed over a purebred pup. However, some people are worried about the back-room breeders who are trying to make a quick buck by capitalizing on the popularity of designer breeds, and rightfully so! But there is no guarantee that a breeder is reputable just because a pup has papers and a higher price tag. It is true that you need to be vigilant when it comes to choosing a breeder and making sure the parents and the puppies are in good health. This is something you should always do, regardless of the dog’s breed or lineage. Of course, mutts have always been available for adoption. So, the “new” controversy really has a lot more to do with the popularity of the designer breeds, not the actual dogs themselves. Designer breeds have popped up within the last 10 to 20 years, and they are mutts, or mixed breeds. The only difference between these dogs and the ones you may see at your local shelter is the fact that both the parents are purebred dogs. Basically, the designer dogs are a mix of two breeds, while a mutt may have a genetic lineage from any number of breeds. The topic of genetics is often brought up when individuals debate about purebred vs. designer dogs. Some people state that health issues can develop in mixed breed puppies. It is true that you can see all sorts of different genetic combinations when purchasing a mixed breed pup. Simply put, thanks to these combinations, you may see numerous health issues in your canine that are associated with both the breeds. For example, your dog may develop hip dysplasia common to Labradors and also heart disease associated with Great Danes. On the other hand, you may also adopt a puppy that is completely healthy with very few to no health problems. Purebred dogs are more prone to health problems due to their genetic makeup. This has a lot to do with something called hybrid vigor. Hybrid vigor is the term used to explain how inbreeding can reduce a dog’s genetic diversity. When genes become more homogenous, or similar, then health suffers. This is true when it comes to both genetic diseases and overall health. Genetic diversity may be limited in purebred dogs because many lineages are similar. Also, since dogs have been bred for certain traits, their genetic makeup is oftentimes similar in nature, simply based on how the canines were chosen for breeding in the first place. We know that genetics is very confusing, but the main takeaway is that genetic diversity is the key to canine health. Cross-breeds, like a black Lab and Great Dane mix, are more likely to be genetically diverse, so health issues really need to be addressed on a case by case basis. Now let’s look at the dogs that make up the Great Dane x Labrador cross. The Labrador retriever is one of the country’s most popular dogs. You probably already know this if you have been looking at mixed Lab breeds. Labradors are traditional English dogs. These working dogs got their name because of their ability to retrieve game and fishing nets from the water. The Labrador’s oldest ancestor is the St. John’s water dog. This dog was quite popular in Newfoundland, and was brought over to England in the 1800’s. It was bred with other smaller dogs, and this is where the Labrador retriever came from. There are actually two types of Labrador retrievers, the American and English varieties. Typically, the ones we see in the United States are the European ones, and these dogs are used to create canine mixes like the Labradane. Great Danes are extremely large dogs. It may not come as a surprise to learn that the canines were created by crossing the equally large Irish wolfhound and the English mastiff. Great Danes were bred as working dogs to hunt English boar. The canines originate from Germany, but they have a long history in England as well. Specifically, the dogs were often used to protect estates, carriages, and nobility. Great Danes are sometimes called German mastiffs, since the dogs do originate in Germany. So, what does a Great Dane Lab or a Lab Dane mix look like? The canine will have a mix of physical attributes based on the parents, so let’s take a look at Labradors and Great Danes. The Labrador Retriever is a medium-sized dog that is about 55 to 80 pounds. The dogs have round, broad heads and sit about 22 to 25 inches off the ground. The canines tend to live about 10 to 12 years. Great Danes are definitely considered large dogs (much larger than Labs). They stand at a whopping 28 to 34 inches tall and weigh between 100 and 200 pounds. This weight may seem a bit high, but the vast majority is due to the powerful and sleek muscles that line the body. Unfortunately, Great Danes usually only live between six and eight years. The Great Dane cross Labrador will have a mix of physical characteristics that are similar to both the Labrador and Great Dane. While an exact phenotype, or set of physical characteristics, cannot be predicted, your pup will probably have a height and weight in between the two dogs. So, you can expect your Labradane to be a medium- to large-sized dog that is well over 100 pounds and close to, or more than, 30 inches in height. Basically, if you look at a Labradane growth chart, the canines will be less heavy than a pure Great Dane. The good news is that the lifespan of the mix seems to be closer to that of the Labrador, so your canine will live a long and happy life of 10 years or more. 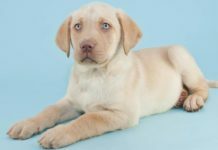 Just like physical characteristics, you need to look at the parents when figuring out the type of personality your Lab Great Dane mix puppy will have. Fortunately, both Labradors and Great Danes have a lot of the same personality traits, so you can predict the personality fairly easily. The best news is that these dogs are great for families with children. Labrador retrievers are known for their sweet personalities. There are a few words used to describe the dogs, including gentle, loving, and loyal. Of course, the dogs also have a fun and active streak. Labs love to play and chase, and this is one of the reasons why the canines are often suggested for families. Great Danes are also affectionate, gentle, and loyal. They are fiercely protective of their owners and make excellent guard dogs, barking when danger or trouble is detected. While Great Danes are considered stoic and dignified, they are eager to please, just like Labradors. Labradane breeders often say that their pups retain the loving, gentle, and loyal qualities of their parents. In some cases, the dogs do have a bit of a stubborn streak. This is due to the Great Dane and its strong willed temperament. 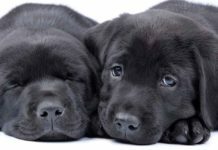 Labrador Great Dane pups do respond well to obedience and training classes, if you do happen to adopt a stubborn canine. Just remember that reward-based or positive reinforcement training is best. According to Dr. Stanley Coren, positive reinforcement is not only more effective, but it leads to happier and healthier canines. 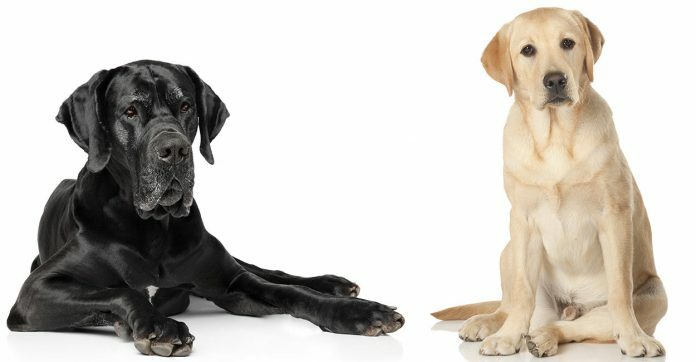 There are a few unique things about Labradors and Great Danes that can lead to some grooming concerns. The Labrador and Great Dane mix will often have hair similar to that of the Great Dane. Since these dogs have short and dense hair, shedding is not a huge issue. However, the Labradane will shed seasonally like most other dogs. This means you can get away with a weekly brushing schedule, until fall and spring roll in. Daily brushing is often required during these times of the year. The color of your dog’s coat may mean that you need a more regular grooming schedule. After all, Great Danes are large dogs, and Labradanes are pretty big, too. So even though the dogs may not shed a lot, you may see bits of dark brown hair on your furniture, simply due to size and hair color. The Labrador Great Dane cross can be a number of colors, depending on the mix of the Lab and Great Dane. You can expect your chocolate Lab Great Dane mix puppy to be dark if the Great Dane was also a black or chocolate color. Of course, the hair shed from these dogs will certainly appear on your white couch or cream-colored carpet. Labradanes may have bridle, fawn, harlequin, and blue coloring as well. Outside normal care and grooming, there are few concerns, except for some drooling issues. You may know that Great Danes drool a bit. Excessive salivation, or ptyalism, is something that affects the breed. Research studies do indicate that a disease called craniomandibular osteopathy (CMO) can cause even greater salivation in canines like Great Danes, but the problem is usually normal. Some salivation is also normal in Labradane puppies. Of course, your pup may not drool at all- you will need to wait and see. If this is an issue for you, the Labradane may not be an ideal pet for your family. We briefly described how mixed breeds can develop health issues based on the genes inherited by the mother and father. It can be heartbreaking to adopt a pup with a chronic or fatal illness. This is why it is always advisable to speak with breeders about genetic testing. Genetic tests will reveal the health of the mother and father and whether or not the parents are carriers for certain illnesses. Since genetic tests are now inexpensive, widely used, and readily available, it is not out of the question to insist on working with a breeder who can verify healthy parents with DNA tests. With that said, some people may seek out a puppy without asking for test results. You may also fall in love with a Labradane at your local shelter. 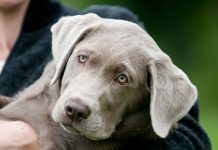 So, we want you to know about a few of the health issues that most commonly affect Labs and Great Danes, in case your dog does become ill. 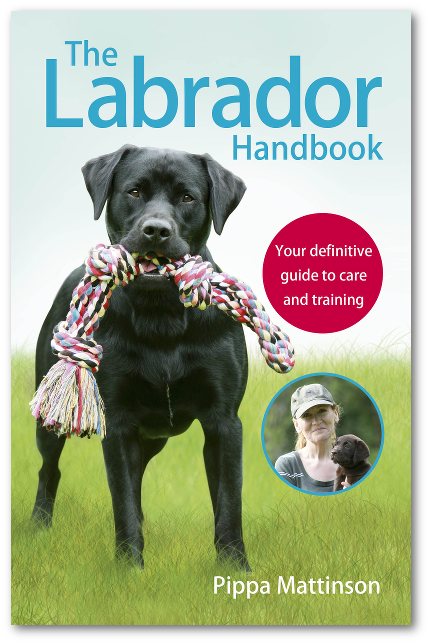 When it comes to Labradors, there are a few things to be aware of. Orthopedic issues are common and affect the elbows and hips. Specifically, the canines are prone to hip and elbow dysplasia, and these illnesses seem to have a genetic component. Studies also suggest that Labradors are prone to arthritis due to the breakage of cartilage tissues within the joints. This type of issue is also a genetic one. 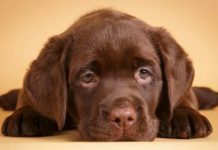 Some Labradors will develop congenital heart issues. They are prone to the development of malformations of the tricuspid valve. The dogs also may develop something called Ebstein’s anomaly, where the tricuspid valve forms low within one of the ventricles of the heart. Other cardiovascular issues can occur as well, and this is one reason why Labradors can succumb to something called exercise-induced collapse. This happens when the dog goes into cardiac and respiratory distress after exercising heavily. Research shows that the issue appears for the first time when dogs are about 12 months old. Labradors do tend to develop cancer more often than other dogs, so this is something to be aware of. Now that you know a little about potential Labrador health problems, let’s take a look at some of the ones that Great Danes are prone to. Hip dysplasia, elbow dysplasia, and arthritis can show up in Great Danes. 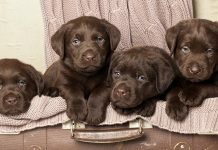 Since these things are also sometimes seen in Labradors, you should definitely speak to your veterinarian about orthopedic concerns when you adopt Labradane puppies. Another orthopedic issue, called panosteitis, is also a concern. This ailment involves bone inflammation due to the rapid growth of bones. Panosteitis typically involves the leg bones. Since Labradanes are a bit shorter than Great Danes, it may not be an issue for your pup. Wobbler syndrome is something you should be concerned about. The ailment is a neurological one that involves the nerves in the spine and neck. Specifically, dogs affected by the disease have smaller spinal canals, and this causes compression of the spinal cord. Compression causes a great deal of pain. Wobbler syndrome is thought to be a genetic disorder, and according to the College of Veterinary Medicine at Ohio State University, the illness affects about 4.2% of all Great Danes. Heart ailments, including an enlarged heart, may be a problem. Heart issues are often associated with larger dogs, and Great Danes sometimes develop congestive heart failure. Like Labradors, Great Danes can be born with certain heart defects like valve defects and stenosis of the aorta, so this may be a concern with your Great Dane and Labrador as well. Is the Great Dane Lab Mix the Right Dog for Me? So, you think you are ready to adopt your Great Dane Lab puppy? Well, just make sure to find a reputable breeder in your area who can also show you that the parents are healthy. Make sure to inspect the parents closely, ask for genetic test results, and also look over the puppy you desire for any obvious signs of illness. Of course, you should keep in mind that your Great Dane yellow Lab mix is going to have a mix of genetic material from both parents. This means that you are likely to see a variety of personality and physical traits, and certain disorders may be a concern. As always, work with your veterinarian if you have any immediate concerns about health. Do you have a Labrador Retriever Great Dane mix, or are you thinking of adopting a mixed breed Labradane? Let us know in the comments below. Kook, P H (2013). Ptyalism in dogs and cats – a short review. In: North American Veterinary Conference, Orlando, U.S., 19 January 2013 – 23 January 2013. Susan M. Taylor, Cindy L. Shmon, G. Diane Shelton, Edward (Ned) E. Patterson, Katie Minor, and James R. Mickelson (2008) Exercise-Induced Collapse of Labrador Retrievers: Survey Results and Preliminary Investigation of Heritability. Journal of the American Animal Hospital Association: November/December 2008, Vol. 44, No. 6, pp. 295-301. My Lola belle is such an amazing girl! Legs of a black lab and head of a Dane. Her personality is out of the water. She is so goofy and smart. My other dog who is a purebred GSP is her boyfriend and I tell you what. Almond joy and Lola had two litters and their puppies are great looking pups! I’ve had her since six weeks. She was the runt of a 17pup liter! She just turned 4 in August’s and I love her and almond more than anything! Her nails though! They grow so fast!! How can I do something about that because she doesn’t sit for me to clip them! I’m in the vet every other week! I had never heard them called labradanes before, but I have one. Her mother was a harlequin Dane and dad a Lab I’m assuming was black. She is a blue Merle, 3 years old and 80 pounds. She was very easy to train, highly intelligent but does have a little stubborn streak. We have had Dane experience and her temperament and activity levels are very similar. I would have another like her in a heartbeat! !